The problem of efficient use of resources in wireless access networks becomes critical today with users expecting continuous high-speed network access. While access network capacity continues to increase, simultaneous operation of multiple wireless access networks presents an opportunity to increase the data rates available to end-users even further using intelligent cross-network resource sharing. This paper introduces a new integrated mobility and resource management (IMRM) framework for automatic execution of policies for cross-network resource sharing using traffic offload and pre-emptive resource reservation algorithms. The presented framework enables both mobile-initiated and network-initiated resource sharing policies to be executed. 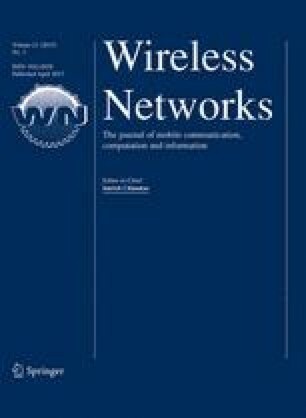 This paper presents the framework in detail and analyses its performance using extensive ns-2 simulations of the operation of a set of static policies based on measured signal strength, and dynamic pre-emptive network-initiated policies in a WiFi/WiMAX scenario. The detailed evaluation of the static policies clearly shows that the quality of voice applications shows large deviation, mostly due to very different levels of delay in access networks. Based on these conclusions, this paper presents a design of two new dynamic policies and shows that such policies, when efficiently implemented using the new IMRM framework can greatly improve the capacity of the network to serve voice traffic with a minimal impact on the data traffic and with a very low signalling overhead. Gundavelli, S., Leung, K., Devarapalli, V., Chowdhury, K., & Patil, B. (2008). Proxy mobile IPv6. In IETF RFC, August 2008. http://www.ietf.org/rfc/rfc5213.txt.